M60 Alarm Dialer 5:01 pm on July 3, 2012	The Mk4 Alarm Autodialler from the 1960’s! The Mk4 Alarm Autodialler from the 1960's! Notice the Reel to Reel Tapes on top and the Internal Valves. This Early Autodialler certainly did not connect to the GSM Networks, this was a pure PSTN machine with Pulse / loop disconnect dialling. We still have one in our showroom purring away! 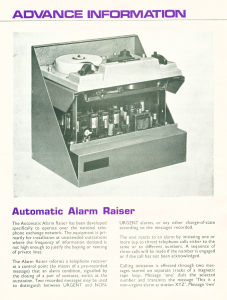 CLICK HERE to read more from the article The Mk4 Alarm Autodialler from the 1960’s!